On March 14, 2007, the National Park Service's California Mediterranian Research Learning Center and Cabrillo National Monument, in partnership with HPWREN and the San Diego State University's Field Stations Program, hosted a booth at the 2007 San Diego Science Alliance High Technology Fair in Del Mar. Susan Teel, Director at the California Mediterranean Research Learning Center provided a summary which can be found at http://hpwren.ucsd.edu/news/20070325/images/High_Tech_Fair_summary.pdf. 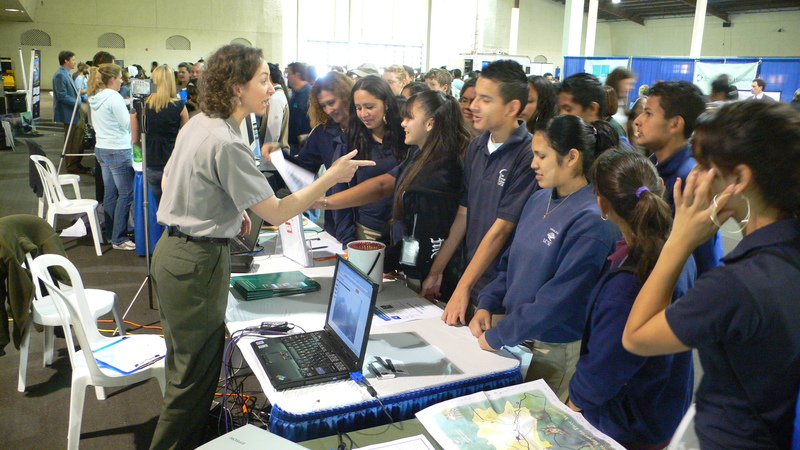 Cabrillo National Monument Ranger Patricia Heusner is demonstrating Live Interactive Virtual Exploration technologies to attendees of the 2007 San Diego Science Alliance High Technology Fair.